The medical, social and political challenges faced by governments in the region seem overwhelming. Yet, nothing is more critical for officials dealing with these myriad challenges than having secure and reliable communications with the world outside their borders. The turmoil in the Middle East and the Ebola epidemic in West Africa present their own individual communications challenges and requirements. Common to both, however, is the need to safeguard the integrity of mission-critical information from interference, malicious actors and targeted attacks. MTN Government (MTNGOV) offers the highest security and efficiency as well as seamless transitions between multiple satellites ensuring consistent connectivity. Our goal is to provide these regions with the confidence that their communications are protected. The African continent is one of the least-connected regions of the world. With the exception of a few urban coastal areas, the continent lacks the fiber and cable infrastructure that most of us take for granted. There are undersea cables on the coastlines, but terrestrial infrastructure, except in South Africa, does not exist in the interior of the continent. With the spread of the Ebola epidemic, the demand has soared for high-bandwidth applications such as telemedicine for acute care, particularly tele-ICU. Not only is telecommunication necessary for treating patients, but parochial schools are looking into video conferencing as a way of extending education to sick children to avoid the spread of infections at school. Today, satellite communications use standard and high-throughput VSAT capability to bring telemedicine, much needed telecommunications and distance learning capabilities into remote regions where there’s no terrestrial telecommunications infrastructure. MTNGOV focuses on the continuity of operations through seamless connections and a range of options to meet secure voice, video and data requirements. 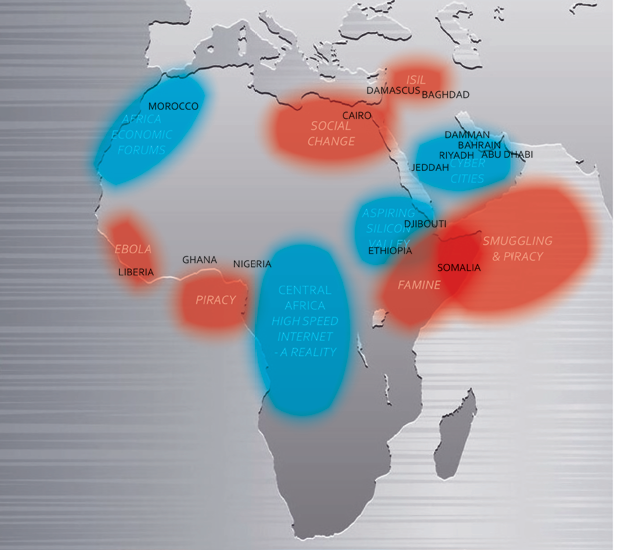 The company uses global and regional VSAT solutions using C-, Ku-, and X-band services throughout Africa. MTNGOV’s first priority in Africa is to provide a secure global network infrastructure with a private terrestrial backbone to give users the foundation, confidence and control to exchange critical, time-sensitive information. Governments in the Middle East embattled by militant extremists are looking to create centralized, dynamic intelligence collection capabilities so they can systematically gather and share security reports and possibly resources with allied nation states. Business and governments in the regions need to be protected from outside threats by merging cyber and physical security. MTNGOV’s role is to facilitate intelligence, security risk management and protected environments. The Middle East may benefit by implementing Redeployable Secure Operations Centers (RSOCs). RSOCs are scalable, portable and can be outfitted for different applications, such as a communications facility or data center. With such communications tools in place, this allows MTNGOV the ability to engineer a full end-to-end solution including the space segment, ground segment, teleports, management and equipment. The flexibility of RSOCs allows Middle Eastern governments to customize solutions according to their individual needs, allowing secure and modular options for all protected communications. Africa and the Middle East regions provide MTNGOV the opportunity to expand and exceed the ever-evolving security needs in disease-stricken and unsecure areas. As a respected leader in satellite communications, cybersecurity and integrated ISR solutions, customers and partners can agilely push the limits of their capabilities. Our role not only provides a high-level network of communications operations, but provides secure, global SATCOM connectivity. It is made possible in part due to our privately owned teleports located in Santander, Spain, and Holmdel, New Jersey. 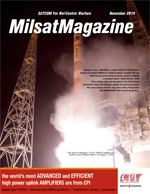 The combined utilization of both teleports provides complete coverage of the Middle East and Africa as well as North and South America with a seamless mixture of C-, Ku- and X-band satellite assets. MTNGOV’s RSOCs were designed for exchanging classified information in almost any location. RSOCs are ruggedized, scalable and can be shipped and erected as remote data centers, information clearinghouses or command centers. As various U.S. government missions are requiring more and more personnel to become mobile, our industry is providing better communication assets that are smaller, lighter and more powerful for expected bandwidth deliverables. Having an agile, innovative culture, with secure solutions and a customer focus, allows MTNGOV to forge strong partnerships that result in high-quality, smart-value solutions, anytime and anyplace. Understanding the convergence of secure global communications, physical and cyber security, MTNGOV has the infrastructure and staff expertise to help the U.S. government and allied nations implement secure end-to-end communications networks. A retired United States Air Force Master Sergeant, Scott Davis has more than 27 years of communications and military experience, with specialized SATCOM and systems engineering management expertise. He spent 13 years at the White House Communications Agency as a senior SATCOM engineer, responsible for ensuring the agency had 24x7x365 global spectrum and network availability. Mr. Davis currently leads MTNGOV’s engineering team in all aspects of end-to-end system design for stabilized and mobile VSAT platforms deployed worldwide. He leads the development of technical solutions for RFPs to ensure technical recommendations meet and exceed customer requirements and also oversees the network engineering team, optimizing satellite and terrestrial networks for government customers, using industry best practices.